Banana pudding is a Southern staple. In the South – and Texas especially – food is love, and nothing says, “I love you!” better than banana pudding. Is your neighborhood having its annual pot luck supper? Count on at least one banana pudding. Did a friend or relative lose a loved one? 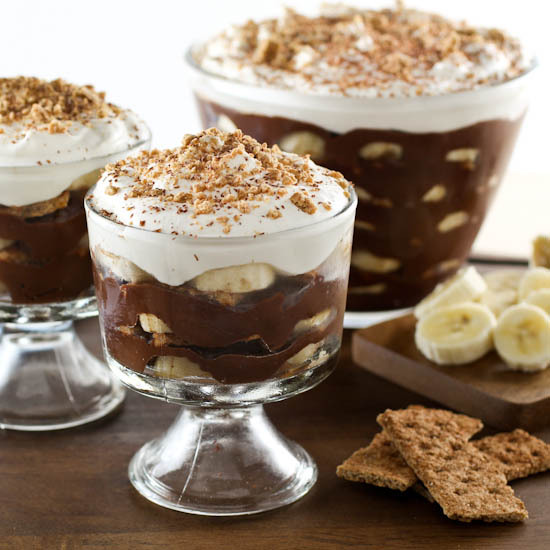 Taking over a banana pudding is a lovely gesture to help comfort the bereaved. Is it your birthday? Banana pudding is ALWAYS better than cake – that is according to my husband who always requests it as his birthday dessert. It can be found as the sweet ending to most holiday feasts from 4th of July to Thanksgiving. I was recently at a BBQ place in Dallas that featured a variety of different banana puddings, among them was a chocolate banana pudding . I got a hearty scoop, and after I devoured my brisket and ribs, I dug in. It was good, but it was not as robustly chocolate as I was hoping. It was a little flat, and I knew I could do better. I felt like that wishy-washy banana pudding had thrown down the gauntlet. Who am I to walk away from a challenge, imaginary or not? 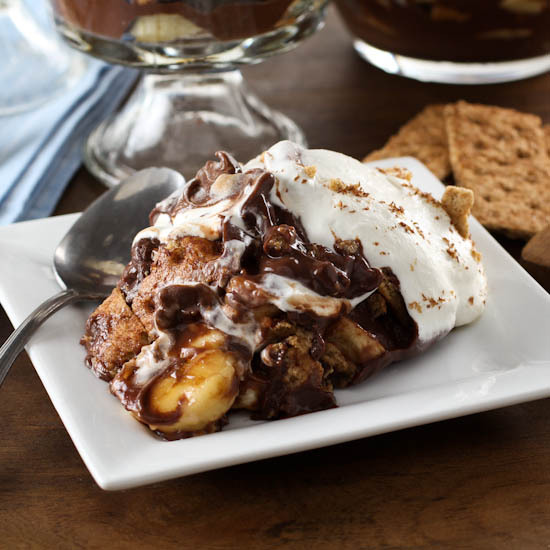 I sat down and thought about the elements that would make a chocolate banana pudding exceptional. First, it needs an in-your-face chocolate flavor. I decided on a dark chocolate custard made with slightly less sugar than a traditional chocolate pudding. 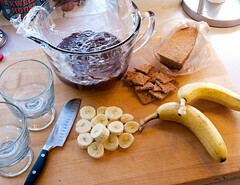 The sweetness of the bananas and cookies more than make up for the reduced sugar. Next, I contemplated cookies. I went with cinnamon graham crackers, instead of the ubiquitous vanilla wafers, because they have a deeper flavor and a hint of spice that compliments the bananas and chocolate. Rather than a fluffy meringue topping I decided to go the whipped cream route. Not to besmirch meringue, but the richness of whipped cream is what I wanted because the potent chocolate flavor and warm spiciness of the cinnamon grahams give this dessert a decidedly autumnal feel. Meringue feels a bit too summery to me. If meringue is your bliss, however, feel free to swap it. The only tip I feel I need to add is this: use your blender to mix the custard before cooking. It will make it much smoother and help prevent graininess or lumps. I still take the precaution of pouring the custard through a strainer once cooked, but it is largely unnecessary if you use the blender. In the work bowl of a blender add the milk, egg yolks, sugar, cocoa powder, and cornstarch. Blend on high speed until the mixture is completely smooth, about 30 seconds. 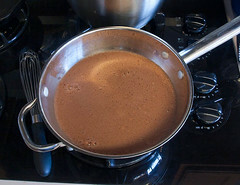 Transfer the mixture to a saucepan and cook, whisking constantly, over medium heat until the mixture begins to boil, about 8 minutes. 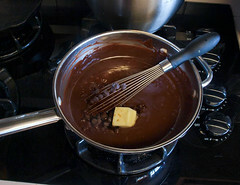 Reduce the heat to medium low and cook for 30 seconds, then turn off the heat and add the chocolate chips, butter, and vanilla and stir until the butter and chocolate are completely melted. Pour the mixture through a strainer into a bowl, then cover with plastic wrap and chill for at least 2 hours, or overnight. 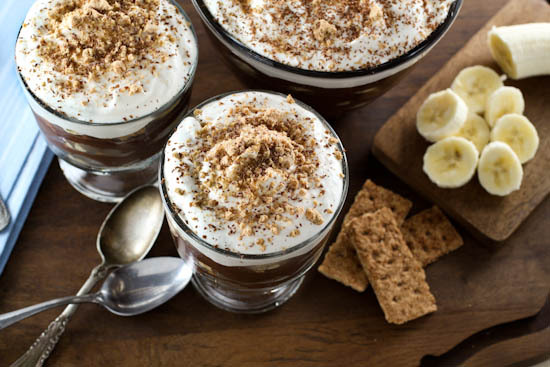 To assemble layer sliced bananas, graham crackers pieces, and chocolate custard, repeating until all the custard is used. For a 9x13-inch pan you will get 3 layers, for a deep serving bowl or trifle dish you will get 5-6 layers, and for individual trifle dishes you will get 4 layers into 6 dishes. Cover with plastic wrap and chill for at least 4 hours, or overnight. When you are ready to serve prepare the whipped cream. In the work bowl of a stand mixer, or in a large bowl with a hand mixer, add the cream, powdered sugar, and vanilla. Whisk on low speed until the sugar is dissolved, then turn the mixer to high and whip until the mixture forms soft peaks, about 1 minute. 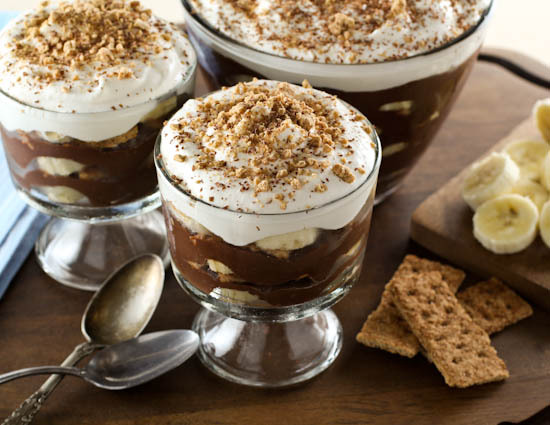 Top the pudding with the with the whipped cream and garnish the top with grated chocolate and graham cracker crumbs.